The northern bald ibis is critically endangered. There are less than 1,000 now in the wild. But an environmental activists group is bringing them back to Europe, where they belong to. They are using an ultralight aircraft to help them migrate towards the Mediterranean. Black body and wide wings makes it look like a crow from a distance but when it lands, you see that it’s a complete different species. The iridescent feathers give it an almost a magical appearance. The long, curved beak and its naked head, with feathers that are styled in Mohawk cut make it look like no other bird in Europe. The name of this bird is Liethe. The species is northern bald ibis, which is critically endangered in the wild. In yesteryear, the species occurred widely in northern and eastern Africa, Asia Minor, Arabia, and parts of Europe. Today there are 600 wild birds in Morocco and about 200 individuals in southern Turkey, and perhaps a few individuals in East Africa. The ancient Egyptians had the notion that the northern bald ibis as an after world divinity. You can clearly see the fondness in hieroglyphs dating back thousands of years. Environmentalists and scientists have come together to bring this beauty back to European sky. There are several northern bald ibis reintroduction projects underway. 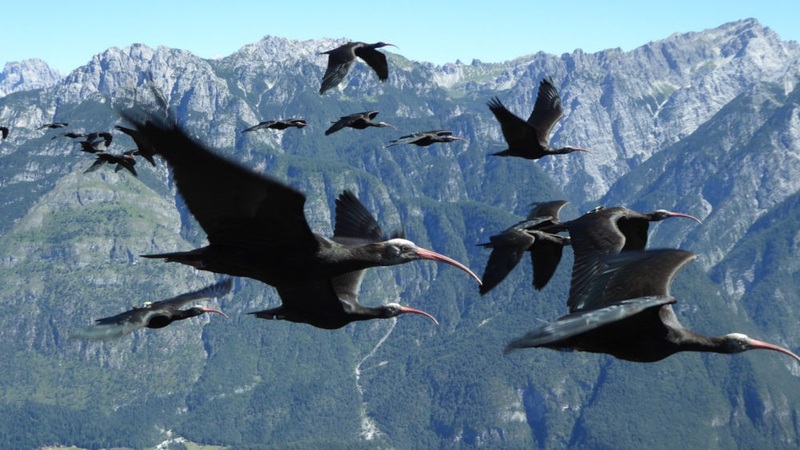 This is why the northern bald ibis can now be seen flying at the northern fringe of the Alps — a habitat that was theirs nearly 400 years ago. The Waldrapp Project has been started to reverse the events that took place centuries ago. The initiative’s founders say that it is the world’s first project that is designed to reintroduce a continental extinct migratory species and to establish a new migration tradition. For your knowledge – The Waldrapp Project was initiated and designed in 2001 by Johannes Fritz, an Austrian behavioral biologist. Today the northern bald ibis have lost their habitat and do not how to migrate there. 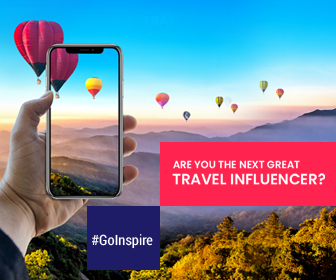 So, to help them, a team led by Johannes Fritz, are flying an aircraft over 1,000km in between two mountain ranges towards Europe with a flock of birds behind them. How to identify the Northern Bald Ibis? The scientific name is Geronticus eremita. 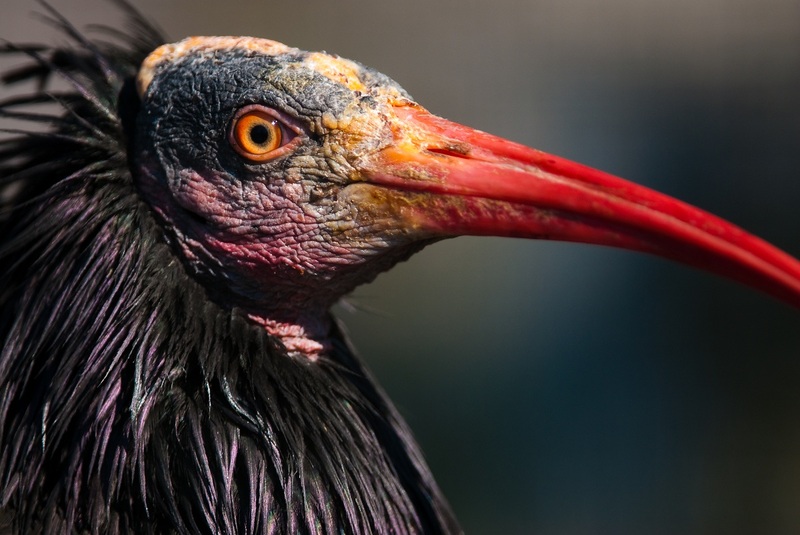 The bird reaches a weight between 1 and 1,5 kg in its lifetime.The plumage of Northern Bald Ibises is black with an iridescent, green and violet sheen. The heads of adult birds are unfeathered and is crowned by a tuft of prolonged feathers. The young ones have grey plumage on their head. For the young ones, the feather tuft is missing or rather not distinctly developed and also their plumage is rather browny- black and less shiny.The red legs and the red, curved and slim beak are identity of this bird that were extinct. Northern Bald Ibises are not scavengers. They feed only on insects and larvae.